ICONOCLASTIC < b> upended the once staid winemaking industry with its lively label art, irreverent wine descriptions, celebration of little known grapes and popularization of the screw top. These things are commonplace now, but Bonny Doon founder and "president for life" Randall Grahm deserves credit for making wine fun while creating some outstanding wine in the process.While there was a period where the winery was unfocused and trying too hard to be clever, Bonny Doon is back on solid ground following the sale of its Big House and Cardinal Zin labels last year. Since then the winery has focused on smaller production wines and its line of biodynamically grown estate wines. Now that the winery has reinvented itself, it's reinventing the tasting room, too. Last month the winery opened a tasting room in an industrial neighborhood on the Westside of Santa Cruz. It's the coolest tasting room I've ever seen. There's nothing like it. Inside the warehouse space is a traditional tasting bar where wine flights are available for $7. (Tasting used to be free at the original location in Bonny Doon, but I guess they have to pay for this fancy new space somehow.) There's a lounge where you can sip at your leisure. In addition, there are three wine-tasting "pods," intimate spaces housed within partially enclosed wine barrel staves where tastings of biodynamic, Rhone-style and library wines are held. There's even a wine tasting with food pairings. The tastings are pricey-—$20–$40—but they last an hour and include your own "wine ambassador" to walk you through the wines. What makes the tasting room even cooler is Le Cigare Volant Café, located on the opposite side of room. Headed by chef Sean Baker of Santa Cruz's excellent Gabriella Café, the tapas-style restaurant features a short but delicious menu of small plates designed to go with select Bonny Doon wines. There's also another wine-tasting bar opposite the cafe counter that's open during the cafe's Thursday–Sunday schedule. At $10, the food is a little expensive on its own, but paired with a glass or flight of wine for $5 or $7 more, it becomes a pretty good deal. The menu changes monthly. The current menu features such gems as the chocolate-and-chianti-braised beef cheeks over polenta, seared gnocchi with braised lamb shoulder, and kampachi crudo with avocado, smoked tomato and bacon. All the food I tried was superb and the wine pairings spot-on. 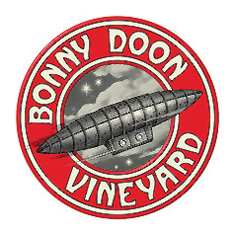 Bonny Doon's tasting room and cafe are part of Santa Cruz's "Westside Wine Village," a cluster of wineries that allow you to walk to several tasting rooms instead of having to drive. The wineries of the Santa Cruz Mountains make some great wines. Getting out the visit them, however, can be daunting. Because the appellation is so large and crossed by mountainous roads, trekking to the wineries can be an adventure or a pain, depending on your disposition. In addition to Bonny Doon there are Santa Cruz Mountain Vineyard, Vino Tabi, Sones Cellars and Pelican Ranch Winery. Across the street are Alexander Cellars and Equinox and Bartolo, makers of sparkling wine and table wine. With Bonny Doon leading the way, the Westside Wine Village makes enjoying some of these outstanding wines a lot easier.